Purpose designed to complement the building aesthetics and give a long maintenance free life span, our range of plastic coated Aluzinc galvanised mild steel louvres, screens and housings, provide a simple solution to some of the problems faced by Architects and building engineers today. Available in a wide range of colours to match the colour schemes of the modern day commercial building. Our louvred products have proved to be an ideal choice for the likes of fresh air intakes, exhaust openings, rooftop plant & equipment screens and weatherproof housings for compressors and similar externally located service equipment. We offer a full bespoke design and manufacturing facility with supervised site erection if required, for all applications that only commence within our manufacturing process following your approval of our computer generated layout drawing. Using a unique interlocking system, louvred blades are rigidly held within a purpose designed channel outer frame that can be easily adapted to suit most building applications. 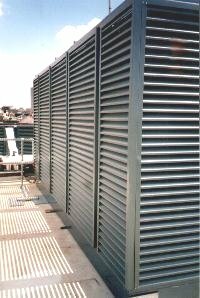 Penthouse louvres can be individually designed to suit each specific application using our flexible modular pentapost casing system and where required, louvred equipment housings can be acoustically treated as necessary to match the prevailing environmental conditions. Our products are satisfactorily employed on numerous buildings located all over the country, installed within systems that are serving well know named clients, large hotels, food processing factories and other prestigious applications.